When I was 17 years old and in my first year of college (a failed attempt…but that’s another story) I nannied for a good friend, watching her two adolescent boys after school until their parents came home. Her boys, who are now grown men (and wonderful ones, to boot), were, at the time, about the age my boys are now–8 and 11 years old. While the boys worked on their homework, or played with friends in the neighborhood, I would read through Elvie’s library of cookbooks. Elvie is a fabulous cook–a talent she passed down to her sons, one of whom is now a chef, himself. I learned more than a thing or two about cooking from her over the years, too, and she and I catered my wedding reception when Eli and I were married. This was my first Julia Child cookbook--based on one of her TV series. It was at Elvie’s house that I picked up my first Julia Child cookbook, which is where I learned how to make omelets. I don’t now remember which cookbook it was that outlined her technique, or even if the way I make them now is at all consistent with Child’s method, but Julia Child is planted at the base of my omelet memories regardless. I could wax nostalgically about Julia Child for days. The Saturday afternoons of my youth were spent lying on the love seat–my mom in her chair and my dad on the couch–somnolently watching Julia Child, The Frugal Gourmet, Yan Can Cook, and Jacques Pepin make all manner of culinary delights while we ooh-ed and aah-ed, and even plotted to make them ourselves. It’s no wonder I turned out to be the food-lover that I am today. All of that is to say that omelets remind me of Julia Child–a rather happy memory from my youth. 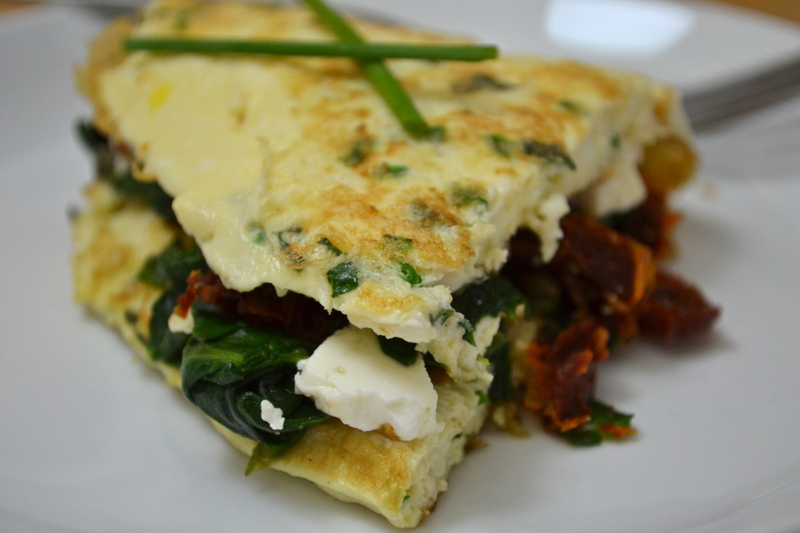 The following is a simple omelet recipe that can be changed in endless ways to accomodate your taste or the leftovers you have in your fridge. I made this omelet yesterday morning, amidst a house full of chaos–wild animals scavenging for stray shoes under couches and sheets of homework flying this way and that. Even the zookeeper has to eat breakfast though, right? The following makes one large omelet that can be cut into two portions. Halve the proportions to make a single-serving omelet. All of the measures given here are approximate, and any ingredients can be omitted or others added as your taste dictates. 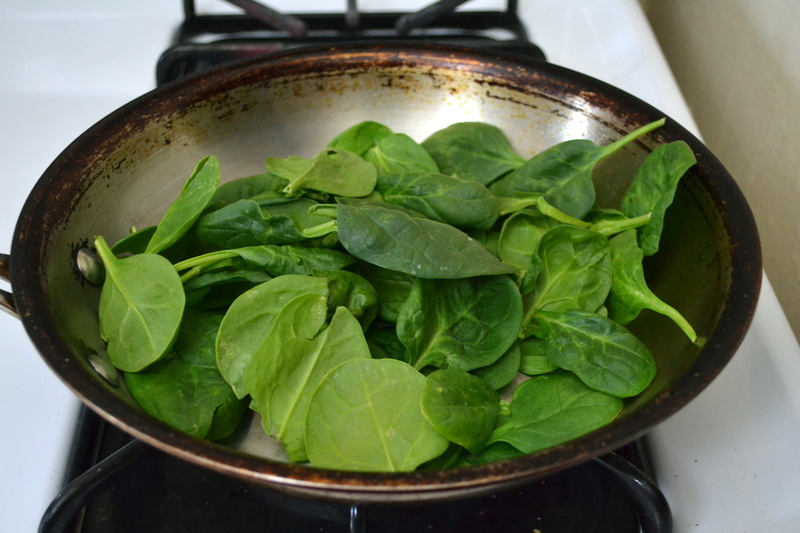 Place the spinach in a medium saute pan set on medium heat, with a tablespoon or so of water. Cover and let steam so that the spinach is entirely wilted, but not turned to mush. Remove the spinach from the pan, and when cooled, chop roughly just so the leaves are not full sized anymore. 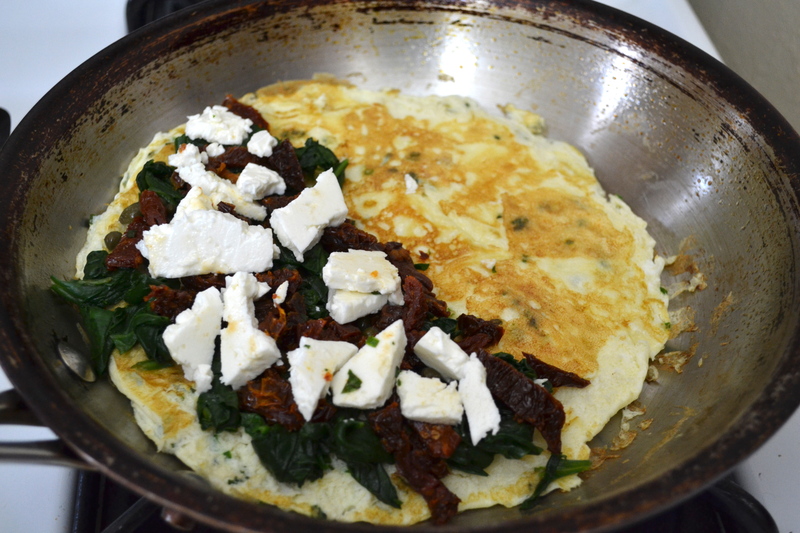 While the spinach is steaming, chop the sun dried tomatoes into thin, 1/4 inch strips and crumble your feta. Beat the egg whites and whole eggs together in a small bowl. 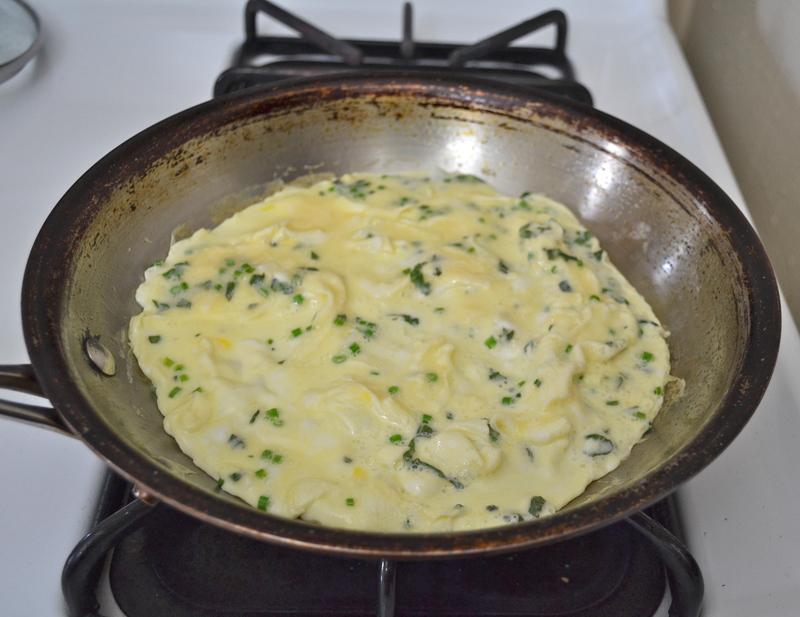 Add the chopped herbs to the eggs along with a pinch or two of salt and a grinding of pepper. Add the olive oil to a medium saute pan set over medium-high heat and let it get good and hot. When the oil is hot it will thin out and look glossy. Turn the pan around in a circular motion to spread the oil over the bottom of it. Add the eggs to the pan and as the outside edges begin to set put them in toward the center with a fork or spatula so that the runny parts continue to move to the outside edges. Repeat this process until the whole omelet just has a thin layer of uncooked egg across it, and then cover the pan with a lid for a minute or so to further set the eggs. Using a spatula, flip the omelet patty over so the set eggs cook all the way through. As soon as you flip the patty, place all of your ingredients on one half of the omelet, placing the cheese as the very top layer so it melts over the rest of the ingredients. Fold the empty side of the eggs over onto the filling, place the lid on the pan, and turn off the heat. Let the omelet sit for a few minutes to warm up the filling in the middle. The feta will soften but will not melt, and the other ingredients, so long as they weren’t cold when you added them to the eggs, will be nicely warmed after a few minutes. Cut the omelet in half and serve hot. Summer on a plate, yum! I’m so ready for summer! We’ve been having the most lovely springtime weather here in the North East and it has whetted my appetite for more sunshine and enough heat to go to the beach. 🙂 easily understandable! We are almost at 20°C here in Hungary as well. This looks so good! I am going to try it this weekend! Thanks for sharing. This is my favorite combination of ingredients. When I have them on hand I like to add artichoke hearts, too. Hope you enjoy yours this weekend. Let me know how it turns out or if you add some new flavor to it.